Ever since I discovered them, I've loved robber flies: they've always struck me as fascinating and slightly fearsome. I've seen them catch prey and, each time, death was instantaneous. 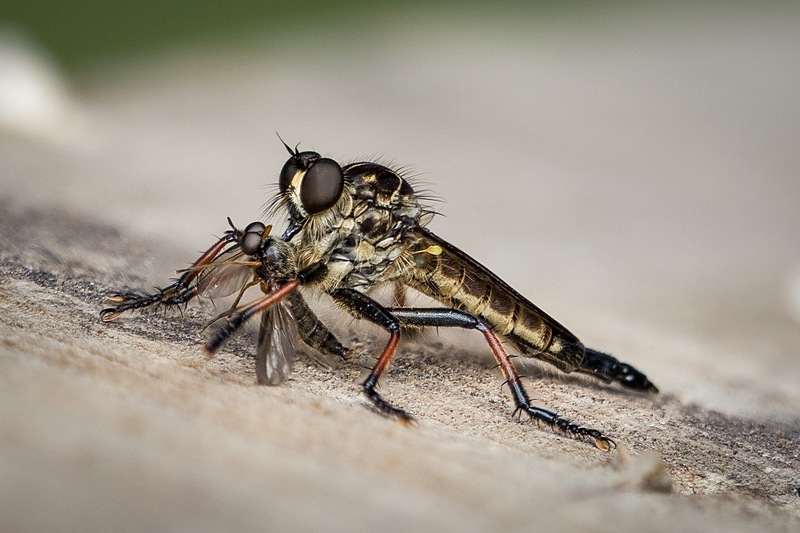 I suppose that's understandable, given this robber fly's preferred part of the anatomy to attack: the junction between the head and thorax (the 'neck', in loose terms). (I've seen this often enough for this species to think this is deliberate behaviour.) I've examined the discarded remains and seen a hole punched clear through, and that must be like having a cork borer the diameter of a baseball (or even larger) punched through your neck. No coming back from that. I found this big female Neoitamus feeding on a soldier fly (eating a cousin doesn't seem to worry robber flies). Look closely and you'll see the beak stuck into the soldier fly's thorax; I didn't see the attack, so I don't know if she repositioned her beak to feed more easily on that soldier fly deliciousness, but it seems likely. The photograph has been focus stacked from eight individual photographs hand-held at f4. Why does this look so much like a tango? Zhoen, you've just made me nervous about dancing. Zhoen beat me to it - and your response is great ... As is the photo.